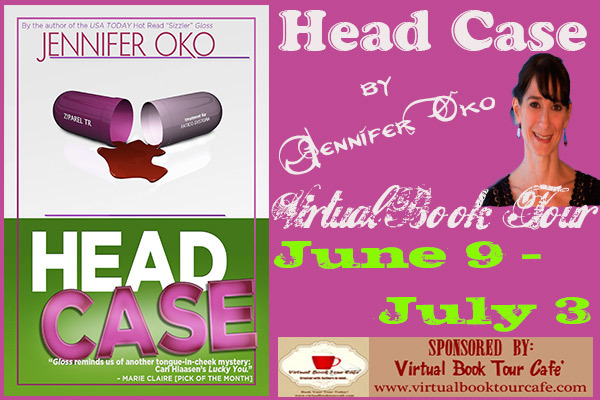 “Head Case” by Jennifer Oko to me is a very gripping and powerful read. Although intended to be more satirical and entertaining I personally found the important points and messages within the book very well presented and not at all trivialised by the more quirky approach. The story is told by a dead woman, Olivia, a phd student in neuro-chemistry, who gets herself involved in the wheeling and dealing behind prescription drugs to the stars and other users. Her friend Polly scores samples from her father and sales rep Missy Pander, who in turn drags Olivia into the pharmaceutical approval committee for new drugs. When Polly starts going out with Russian DJ Mitya a connection is made to his autn on Brighton Beach and what becomes known as the Russian Black Market Babushkas. But all is not well with the drug Ziperal, there are side effects and other issues around the release. At first I found the narrative a little difficult to follow as it jumped between before death and after death, but once I settled in the story ran away in a pleasantly fast pace as we try to figure out exactly why Olivia was killed and by whom. The story is spoken at the readers, something that gives the narrative an extra edge and imtensity. The book is clearly well researched or takes very educated guesses at the connections between black market, research, health care and organised crime. Since “Love and other drugs” and “The Constant Gardener” many of us are aware of the connections between crime and prescription drugs that can exist. Issues of self medication and the consumer approach to mood enhancers are hinted at in the foreword and are part of the story, making this a very rich read, despite the more casual style in places. The friendships and relationships however do not disappoint and manage to transgress the limits of stereotypes and bring more interest to the story. This is a promising author and a well written book. Could you briefly tell us about the book and its story? Head Case is a mystery wrapped up in a comic satire about the influence of the psychopharmaceutical industry on American life. The story takes Olivia and her estranged friend and roommate Polly Warner on a collision course involving ethically challenged executives, spotlight-hungry celebrities, third-rate mobsters, and drug-dealing babushkas. A smart and savvy page-turner, Head Case explores the meaning of personal relationships, emotional intelligence, and mental health while hopefully taking the reader on a synapse-stirring, neurotransmitting rollicking ride. 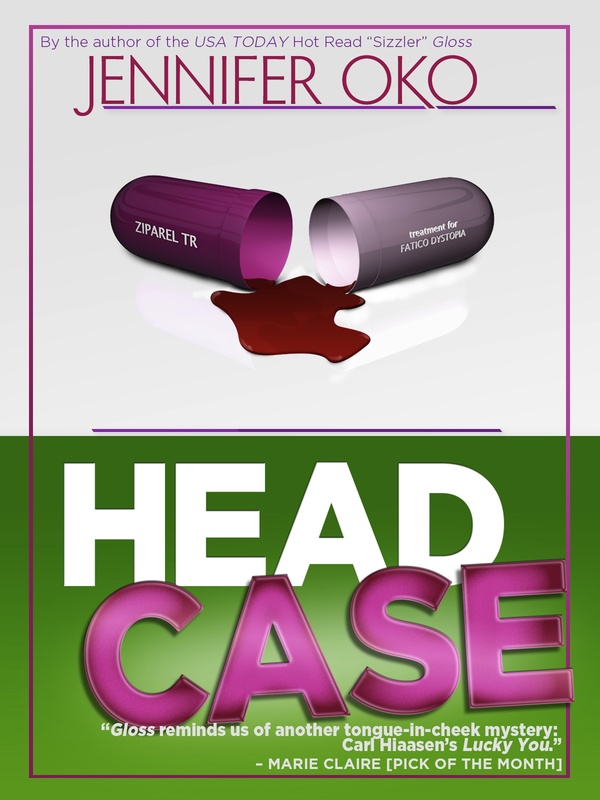 HEAD CASE was the second part of a two-book deal that started with my second book, Gloss (my first book was Lying Together: My Russian Affair). It was originally set to go to press in early 2009—cover created, pages proofed and all—when suddenly the publisher canceled about half of its titles because the economy was tanking and the market for new fiction was going down with it. Head Case was one of those titles. They reverted the rights to me, and I spent the next year revising the manuscript some more. After a few more attempts to sell it to another publisher (“Endearing!” they said. “Flawlessly written!” and then passed, for want of famous authors and guaranteed hits), I stuffed this labor of love into a virtual desk drawer. But then… the world started to change! After reading story after story about once conventionally published authors having lots of fun (and occasionally great success) in the brave new world of digital self-publishing, I realized that an eBook would be the perfect publishing platform for this somewhat unconventional book. Why did you choose this subject matter of prescription drugs? Where does the interest come from? The seeds of this story actually date back almost two decades. When I was in journalism school in NYC, Brighton Beach, Brooklyn was my “beat”for a reporting class. It’s an area of New York with a lot of Russian and Ukrainian immigrants (and it is heavily featured in Head Case). When I was down there on a reporting assignment, I stumbled upon a few elderly women selling prescription medication right out on the sidewalk in broad daylight. The signs advertising their wares were written in Cyrillic, so the English-speaking beat cops were oblivious. Or at least they pretended to be. A few years later, I went on to write an article about all of this for New York Magazine (link!). It was one of the first pieces of writing I was ever paid for. Now, it’s right here next to my desk, nicely framed. At around the same time, a dear friend was visiting. In the morning she realized she had forgotten her medication. I happened to be on the same medication, so I gave her some. That’s when we hatched the idea to write a screenplay about friends trading prescription drugs. Of course, before starting to write, we had to come up with the Oscar speech. So, I stood on the couch, help up an invisible trophy, and said, “I want to thank my friends, my family, and I want to thank Eli Lilly.” We never wrote the movie, but I did start writing the book, combining some of these ideas. Thank You, Eli Lilly became the working title. It would have stayed that way, but I don’t want to get sued. What is your main reason for telling the story? That’s a really hard question to answer. I certainly didn’t set out with an agenda other than to tell a good story. By forcing my fictional characters to grapple with some serious real world issues, I suppose it forces the reader to contemplate those matters. That is definitely a nice bit of icing on the cake. How did you research the background for this book and how long did it take you? In many ways, I was researching the book for years without knowing that was what I was doing. I am fascinated by psychopharmaceuticals. They have been incredibly helpful to many people I know, but I’ve also seen many abuses of them, both personally and professionally (as a journalist). So, it’s an industry I’ve followed for a while. When I started to work on this book, however, I knew almost nothing about how the brain actually works—what happens in which part—so I did a lot of googling around to find interesting and relevant articles. Where did you meet the people that helped you with it? The main “helpers” were the people in my writing group, which was made up of a few friends and friends of friends who became friends. Kindred spirits. In terms of research, much of it was simply a matter of reading a lot, although there are a number of mental health practitioners among my family and friends, so I didn’t have to go too far afield if I had any pressing questions. Tell us about your other book? Are you planning any more soon? Lying Together: My Russian Affair is a memoir centered around a year I spent working as a television news producer in Russia, navigating the collapse of a country and the collapse of my engagement at the same time. After that came Gloss, a comic mystery about a morning television news producer caught up in a conflict of interest scandal. Right now, I am working on something, but I am not fully ready to talk about it—not because I am afraid of jinxing it or having someone steal the idea, but because I am still trying to sort it out myself. My big task for the week ahead is to try to clean up the outline and figure out what this book actually is! On one level, I think I always wanted to be a writer. But professionally, I started out as a television producer. I began working on what ultimately became Head Case because I wanted to have a creative outlet. But then life became stranger than fiction and one day I looked at the diary I was keeping and realized that it read like a novel. I took a memoir writing class and turned the diary into what became an actual book, Lying Together. It was an amazing experience having my memoir published. The day I found out that it would be in the New York Times Book Review, it felt like I won lotto. But no more memoirs. Fiction is challenging to write, but much more liberating. I wish I could say I was one of those people who wakes up at 3 AM and writes for a few hours every day without fail. But I am more one of those people who drags her laptop around to different coffee shops when I have a lunch break, and then occasionally, when I am good and motivated, I have stints of waking up at 5:30 to get in a few hours of writing, sometimes in the basement office I jerry-rigged, sometimes on one upholstered piece of furniture or another, like a cat. I just started an “extreme writing” workshop and had to sign a contract that I would put in a minimum of 90 minutes a day for eight weeks. I am on day three and already have bad black circles under my eyes. But it feels good. Oh! That is impossible to answer! I am very much a writer who revises constantly. It’s always one step forward, two steps back with me. But for this book in particular, it’s even more so. It actually started as a different project entirely, almost two decades ago, then got shelved, then revived, then shelved, then brought back from the dead (like Olivia!). As I mentioned, Head Case was originally the second of a two book deal, but my acquiring editor got laid off by the time I finished writing the first one (Gloss), so there were a number of different editors during that go around. When the economy tanked and the publisher canceled half their titles, Head Case included, I took it back and revised it again, changing it quite a bit. My writing group was very supportive, but at the end I hired a freelance editor that I found on eLance.com. She was fantastically helpful. Absolutely! This is one of the great pleasures of self-publishing. I hated the art for the hardcover version of Gloss and wasn’t in love with the cover for Lying Together, but I only had so much power to change anything. In this case, I commissioned the art myself, so I had as much say as I pleased. Happily, the artist is a very talented friend of mine and he “got” the book immediately. The concept for the cover was his, I just made a few suggestions. Well, initially when I was writing for the traditional commercial publisher, they wanted Head Case to be something else, and I often felt like I was writing with a gun to my head. I finished it, and, as I mentioned, it was about to go to press, cover and all, when the economy collapsed and people stopped buying books. They reverted the rights to me, and it was a huge relief. I spent the next year re-working the book to be better aligned with my vision for it, and now it’s a much better book! What I like most about writing is getting lost in my story. On a good day, when I am in the zone, it’s like I am off on an amazing journey. On a bad day, when I am stuck, it’s awful, horrible, terrible and I start to think that I should just forget about it. But it’s like a drug. I want that good day again, so I keep going back. Happily, there are more good days than bad ones. I handle criticism well, so long as it’s constructive. I couldn’t possibly write without having friends as readers along the way, giving me honest feedback. I feel like I should say Dostoevsky or Tolstoy, but in truth it’s probably Carl Hiaasen (Strip Tease, Nature Girl, etc.). A gazillion years ago, I was introduced to his books while working on a profile about him for a television show. It was a revelation to me that a book could be an outlandishly funny page turner while still having depth. I actually sent him some excerpts of a very, very early incarnation of Head Case, and he sent me an encouraging postcard in return. I am not much of a re-reader, but occasionally I do feel compelled to revisit some of my favorite old characters. I just picked up Master and Margarita by Mikhail Bulgakov. My edition is so worn out that a bunch of pages fell out when I pulled it off the shelf and I now have a stack of random pages and a roll of scotch tape next to my night stand. Olivia, the main character, would probably love it, because she’s very self-involved like that. And Polly would have a love/hate response. Some of it would be terribly uncomfortable for her to read, but in the end I think she would say I did a good job with it. Aunt Zhanya probably wouldn’t be able to read it, because she doesn’t speak English and it hasn’t been translated into Russian (yet!). Missy Pander would probably want to buy up all the copies and burn them. Unfortunately for her, she would have a hard time doing that with ebooks! I love Olivia, the narrator. I actively miss her these days. She feels very real to me, like an old friend who I only see on Facebook from time to time. As for the movies…oh! Please let this one day be a real quandary for me! I really don’t know, except that I am obsessed with the television show Nurse Jackie. I don’t think Edie Falco actually makes sense for any of these characters, but maybe she could play a minor role. What would you take to a lonely island? It might be fun to have tea with Agatha Christie. Just that I hope people find my books and enjoy reading them as much as I enjoy writing them! 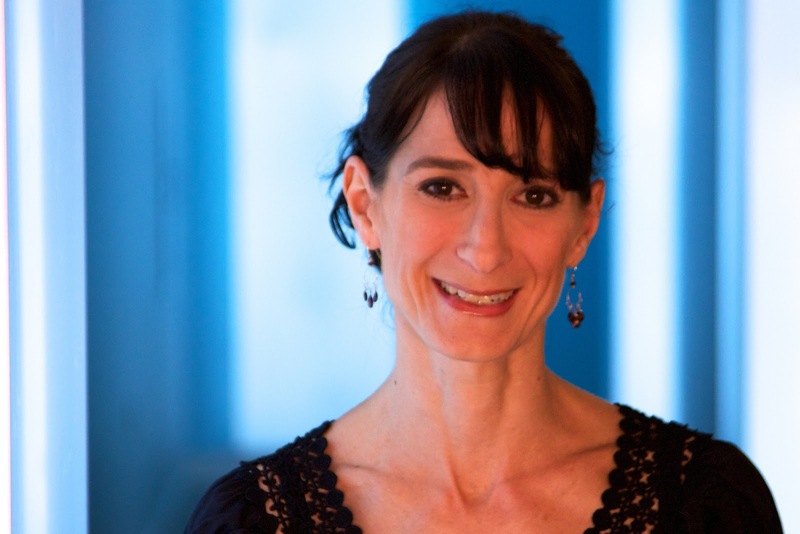 Jennifer Oko’s first book, Lying Together: My Russian Affair (written under her maiden name, Jennifer Beth Cohen), was published in 2004 and received numerous positive reviews. The New York Times Book Reviewcalled Lying Together “riveting” and twice named it an Editors’ Choice. The San Francisco Chronicle raved, saying it was “a heady cocktail” and “a quick, juicy read.” Her second book, a satirical novel about morning television news entitled Gloss, was a Marie Claire “pick of the month” in 2007 and chosen as a “hot summer read” by USA Today. Currently working as a freelance writer and media consultant, Jennifer is a “recovering” journalist and award-winning television news producer. A graduate of Columbia University’s Journalism School, her career has taken her across the country and around the world. Additionally, Jennifer’s writing has been published in a variety of magazines, including The New York Times Magazine, New York Magazine, Maxim, Self and Allure. HEAD CASE is a new, exciting and sometimes laugh-out-loud funny mystery from an author whose work has been called “SIMPLY RIVETING” by The New York Times and “SHARP AND FAST-PACED” by Publisher’s Weekly. It’s like Alice Sebold’s The Lovely Bones meets Carl Hiaasen’s Nature Girl (with a dash of Janet Evanovich’s One for the Money) as Olivia embarks on a postmortem quest to deconstruct the remarkable events that lead up to her mind-altering death. We stopped at a red light and I thought about trying to unlock the door and jump out, but I could see that his eyes were peering at me through the rearview mirror. They appeared to be curious, like he was trying to make sure he got the right girl. Or maybe he was surprised that I, short of stature, thin of frame—conventionally attractive in a conventionally symmetrical sort of way, but not exactly anyone’s exotic fantasy, especially considering the weary, exhausted facade typical of a candidate for a PhD in neurochemistry who was hard up against a number of deadlines and concerns—was the girl he was sent to get. He was no looker, either. His face was puffy but his eyes were squinty, almost closed. The lids were drawn down—the gravity of age, it looked like. But there was something soft about them, something almost sympathetic. These were not the eyes of someone I should fear. At least that’s what I told myself. For a kidnapping cabdriver, this guy was a softie. “Where are you taking me?” I asked again, as composed as I could muster. The traffic stopped and he turned to face me. His face was round, almost cherubic. A bulbous nose. Untamed, wiry white eyebrows, just like the photo on the license. A tweed cap was pushing down what appeared to be unmanageably coarse and long-since overgrown salt and pepper hair. He looked like a combination of Einstein and Mr. Magoo. I could feel my phone vibrating in my pocket and started to pull it out again to see who was calling. Polly’s name was on the caller ID, but before I could answer, the driver waved his finger in the air, admonishing me. I put it back again and held up my empty hands like someone might do after the police tell them to drop their weapons. The traffic began to move. An icy drizzle started splattering on the windshield. He hit the accelerator and the car lurched forward. “Where are you taking me?” I repeated, this time a little louder. He sighed as if I were pestering him with my questions. “Brooklyn,” he relented. “Please. Please, no worry,” he said, apologetically, like I should not think it a big deal that there was a strange man driving me against my will to a place I did not ask to go. I looked out at the East River passing on my left, trying to put all of this cryptic information together, trying to figure out what I should do next. Had I known that I was nearing, well, oblivion, I might have done something differently. I might have ignored Lumpkyn and picked up the phone—told my parents I love them, told that intern over in Oncology that I thought he was cute, told Polly that I was sorry. I mean, what would you do if you were locked in a New York City taxicab with only fifteen minutes left to live? What issue would you want to resolve? The pleasure is mine. Thanks for including me on the tour. Thank you so much, both of you! The review made my day, and the interview was so much fun. It has been a total pleasure. Thanks for the honour of your visit and best of luck with the book!